Good things come to an end also. @markr041 thanks for the FW update instructions. Mine E1 arrived tonight. ISO 1600 in Z-Log looked pretty noisy. I sense, just like the GH4, this camera needs fast lenses. Is there a setting to display an audio meter somehow? I turned on "live view audio" but didn't notice anything new happening... (but my eyelids are getting very heavy :-) More tomorrow. @CFreak I set max ISO to 800. Above that one requires Neat Video in post. I left noise reduction at the default, I like that it is not aggressive in nr, preserving detail. I also did not discover what live view audio does, maybe for external mic? I use AF only to push to focus before I shoot (the up button). Mft lenses and CD AF just do not do well on any camera. The standard color setting produces excellent color, but it cuts off highlights harshly, so you really have to watch for hot spots. Zlog is just great for high contrast scenes, and it really looks like 11 stops. @markr041 Thanks! The AF is doing a lot of hunting, will try it your way. @CFreak Set AF to adjustable zone. Set continuous off. When you push the up button, the frame will turn green when focus is confirmed. I often check focus by magnifying. I set the on/off button to magnify. I push it, and I get the magnification. You can adjust the focus manually then if you don't like what it has focused on. It's all quick. The 20mm f1.7 is a great lens, but it has the worst AF of any current Lumix lens. C-AF may work better with newer lenses. Would it be possible for them to implement some sort of focus peaking through a firmware update? Or for that matter, for one of the hackers here to figure out something like that and hack it? Crazily the white "gift" version is even more expensive! @digger The wide S16 lenses will not cover. 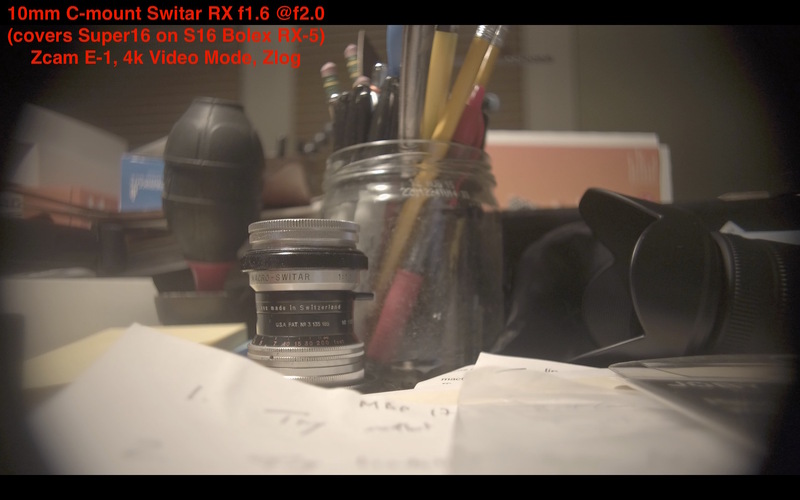 I tested a 10mm f1.6 Switar RX and a 26mm f1.1 Switar RX. 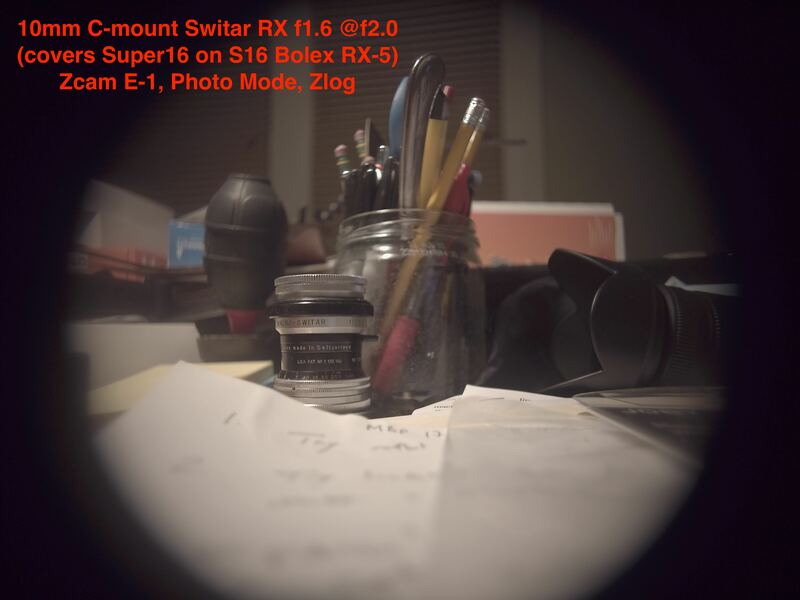 The 26mm covers, but all RX lenses suffer from a "swirly bokeh" effect when wider than f3.2. FYI some fast C mount glass will bottom out on some MFT to C mount adapters. NB: there is no peaking in the camera, but, there is a punch-in-focus feature, that only works when the camera is not recording. In other words, pulling focus while shooting is just guessing with the resolution and small size of the screen. When things are in focus, the pixels get a little "sparkle" (moire) to them like on the GH2, it's not that easy to see on the small screen. The camera is doing some cropping in UHD mode. Haven't tested in DCI 4k. 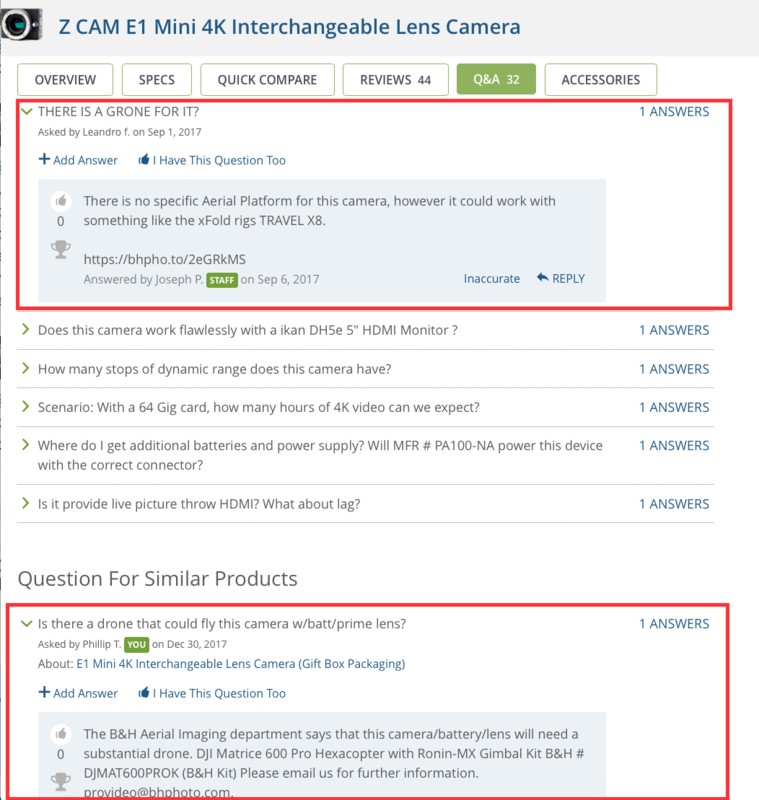 I had an issue with the Zcam App, contacted Zcam on their FB page and got a response in 12 hours. They sent me a "Quick Start Guide 2016" which cleared it all up. Basically to get live view on the phone app, you cannot connect via bluetooth, you must connect via wifi. This guide did not come in the box from B&H. The camera is heavily UI driven in the app, once connected via WIFi. Setting the shutter speed manually in the camera, didn't really work (it seemed to be in auto/variable shutter), but, setting it via the app, did lock it in. Is it possible to connect to multiple cameras? I mean to copy settings or set them separate without reconnection? @cfreak thanks for this. which adapters do you have? Do you have a PL to MFT adapter? What drone works well with this? @CFreak , who said:"Setting the shutter speed manually in the camera, didn't really work (it seemed to be in auto/variable shutter), but, setting it via the app, did lock it in." You can set the shutter speed manually in the camera. There is NO difference in what you can set in the app and what you can set in the camera. None. And you can set ISO, WB, shutter speed, iris, EV manually or as auto individually in the camera. Are you using firmware .3? You can do a push-finger focus pull with the app though. @markr041 yes, I'm on fw 0.3. I related just my own experience: I updated the FW to 0.3, started setting up the camera to my favorite settings: UHD 24p 1/48th. However, I noticed something was in some type of auto mode, looked like auto shutter to me, despite having it set to 1/48th in the camera menu. At this point I hadn't used the app yet. 1st I only used the app in BT mode. Then a few days later, linking to the app via wifi, and setting 1/48th in the app changed that behavior. This is just my experience, and I am relating it as there maybe others reading here who are also, like me, new to the camera. I am happy this auto shutter effect has disappeared. @Vitaliy_Kiselev I don't know, I only have one camera. I suspect the app reads the in-camera settings upon connection and displays them in the app's UI. I didn't see any possibility to copy settings across multiple cameras.